DJ LiveProductions is not just about offering DJ services. 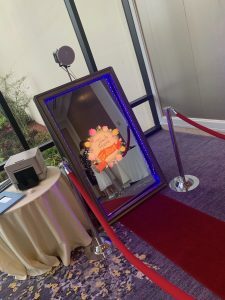 We also offer a great line of Magic Mirror Photo Booths. 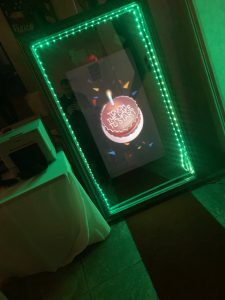 We have two different models of booths to offer you, The Retro Magic Mirror and the Classic Magic Mirror Booth. The Retro Booth is the booth to have in a smaller venue where space is limited. 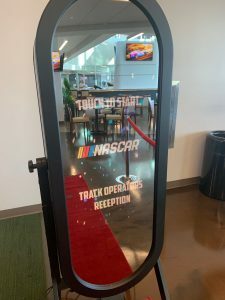 The Classic Mirror Booth commands the attention of any room it is in, as it invites your guests to come over, interact with it, and have some fun as your perfect picture is taken. Both Booths can text the pictures to your phone right then and there. Not only is the PhotoBooth a great way to personalize your event it also gives your guests a keepsake they can treasure for years. All of our Photo Booths come with an unlimited amount of 4x6 prints, fun props, an attendant, and lots of entertainment for your guests. 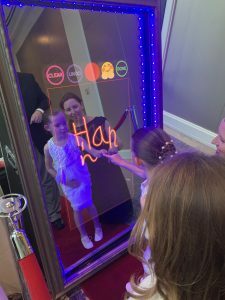 The Magic Mirror is the only Photo Booth that can have your guests sign the mirror screen, and that signature gets put on the print. It is the moat interactive Photo Booth out there. We can customize the entire Photo Booth around your event. ©2015 DJ Live Productions, all rights reserved.